Click the button below to add the Ultimate Holster Slide to your wish list. This simple holster can save you a lot of money. 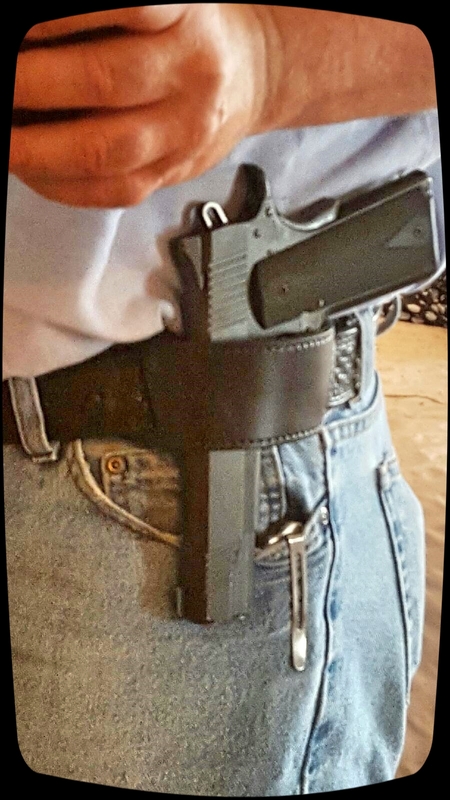 The Holster Slide belt/holster can be worn anywhere on your belt (including cross-draw). Before you drop big bucks on a custom holster, use the Holster Slide to determine the most comfortable carry position for your needs. 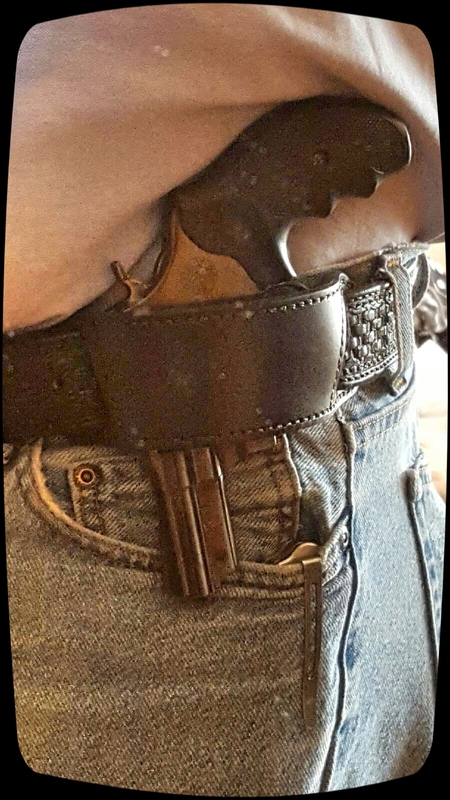 Once you KNOW where YOUR carry is comfortable, your can shop for custom holsters designed for that position of carry. Or, like me, you can simply choose to make the Holster Slide your everyday holster. Double layer leather (front and liner) becomes a holster when attached to your 1 1/2" wide gun belt. The simple design, when coupled with a premium gun belt, becomes a surprisingly great holster. Our Double Stack model affords premier retention for just about any large (double stack) automatic, and most small sized revolvers. It also provides more than adequate retention for single stack, smaller pistols. Our Single Stack model will only be effective with smaller semi-automatics. If you're not sure which one to get, we suggest you try the double stack model first. 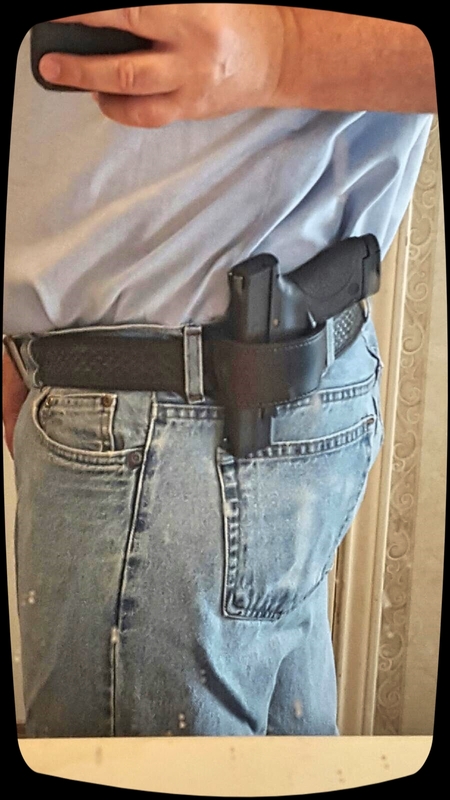 Our Holster Slide pairs with your belt to securely holster any size semi automatic pistol, or your J Frame revolver. 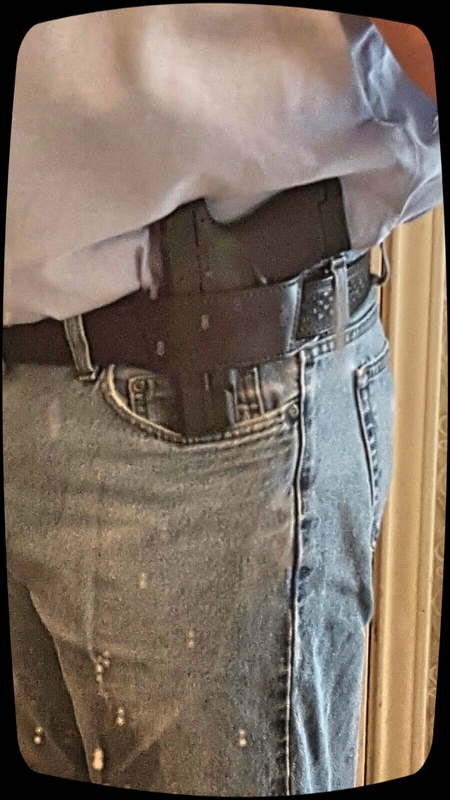 The Holster Slide stays open for reholstering, or you can "pat" it closed to make it virtually disappear on your matching belt. The end tabs on the Holster Slide keep the opening static so that retention (better retention than any hybrid holster) is maintained for whatever sized pistol you are carrying. Switch to a larger gun, and the opening automatically opens just enough to holster it. Switching to a smaller gun? Simply give the Holster Slide a light "pat" to slightly close it, and put the new pistol in. The Holster Slide opens just enough to accommodate the smaller handgun. 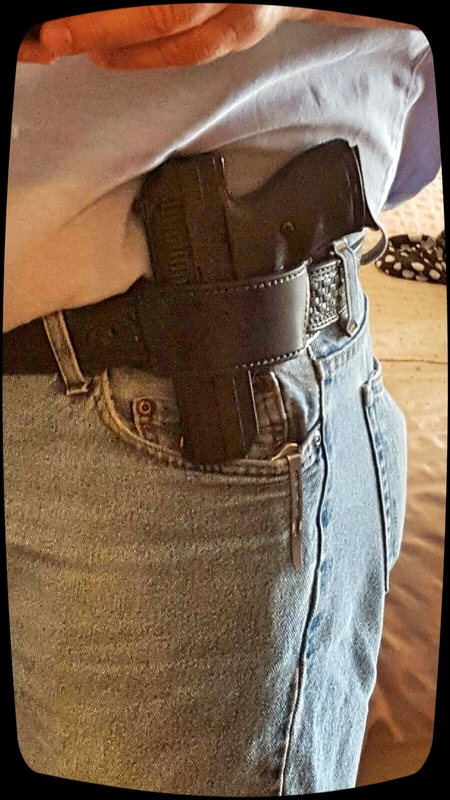 Jim S. sent us some pictures of his new Holster Slide. He is wearing it strong side appendix and behind the hip with four different sized firearms. Jim says he loves the Holster Slide and can't decide which spot on the belt is his favorite. Hey Jim, It also works on the hip and cross-draw. As soon as I tested the Holster Slide it immediately became my favorite holster, and when I go to the range, it's the only holster I need regardless of the number of pistols I bring. This works for me, love the idea of the slide, able to use as a multi holster.